High blood pressure (hypertension) can cause stroke, heart attack and heart disease and is the largest cause of disability and premature death worldwide. This type of disease is difficult to detect and may not show any sign for years. What is actually blood pressure? It is the pressure of blood on the walls of blood vessels (arteries) in any part of the body. The pressure is variable, changing throughout the day and night and is subject to many external and internal influences. 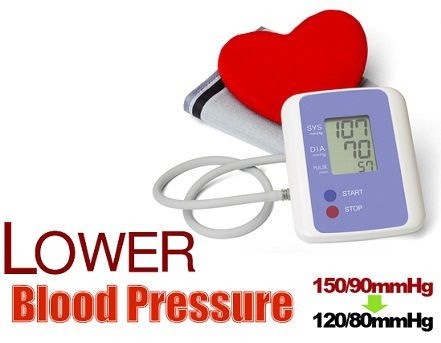 Normal blood pressure values, which allows normal life and does not harm the system of blood vessels, is 120/80 and over 140/90 is considered as high blood pressure. If your pressure is too high, it further burdens the heart and blood vessels. With time, this additional load can damage body organs and cause health problems. If you have high blood pressure and no control over it, you increase the risk of heart attacks and stroke. High blood pressure can also cause heart disease and kidney disease and is associated with some forms of dementia. Most people who have higher blood pressure values ​​are not even aware of it, because we do not have any discomfort symptoms. Occasionally when the pressure is extremely high, you may feel pain and pressure in the head. One of the possible symptoms is flushing, which is a consequence of increased proliferation of blood vessels of the skin due to increased blood flow and bleeding from the small capillaries in the nose. It happens because of the sensitivity of capillaries that fail to withstand internal pressure and shoot it. Sometimes a person with high blood pressure is easily tired, experiences difficulties in performing everyday tasks and concentrates poorly. Anxiety and accelerated heartbeat can indirectly warn about increased pressure. Previously mentioned signs normally are present in the early stages of the disease. It is clear that the increased pressure is usually diagnosed accidentally by measuring pressure during a medical examination. If you are diagnosed with high blood pressure, one of the solutions are drugs prescribed by your doctor and second – start to live healthy and thus reduce the pressure. The following six changes in your diet and activity can affect your blood pressure. Too much salt raises blood pressure, so you can reduce your salt intake. Most of the salt that you consume is not the salt you use to salt food – bread, cereal grains and finished dishes. Do not add salt when cooking or salt your meals additionally. When you buy food, check the labels on the packaging and choose food with low salt. -Buy fresh, plain frozen, or canned “with no salt added” vegetables. -Use fresh poultry, fish, and lean meat, rather than canned or processed types. -Use herbs, spices, and salt-free seasoning blends in cooking and at the table. pasta, and cereal mixes, which usually have added salt. -Choose “convenience” foods that are low in sodium. often have a lot of sodium. -Choose ready-to-eat breakfast cereals that are low in sodium. -Rinse canned foods, such as tuna, to remove some sodium. Consumption of fruit and vegetable lowers the blood pressure. Diets rich in fruits and vegetables can help lower your blood pressure and reduce your risk of heart disease. Adults should take five servings of fruit and vegetable daily. One meal contains about 80 grams of fruit or vegetable, which is about a palm. Eat variety of fruit and vegetable. It can be dried, frozen or canned, but beware of extra salt, sugar or fat. The healthy antioxidants, phytochemicals, and vitamins and minerals found in fruits and vegetables work to help control blood pressure. Garlic, onion or beets are great food products if you are willing to lower blood pressure. If you drink too much alcohol, this habit will increase your blood pressure in time. Recommended value for men is 21 units of alcohol per week and 14 units of alcohol for women. 300 milliliters of beer, a small glass of wine or a shot of fiery liquor are the recommended units. If it is necessary, lose weight. It will reduce your blood pressure and the risk of heart disease. The best way to lose weight is by choosing low-fat and low-calorie food products and increase your physical activity. There is no need to stick to strict diet rules to lose weight. Define some realistic goals. Make small changes in your diet and physical activity, so you can practice these habits for life. Thirty minutes of moderate exercise five times a week will keep your heart healthy and reduce your blood pressure. If you can not find 30 minutes to exercise during the day, it may help if you slightly increase your physical activity. Any activity that will make you sweat and run out of breath for a while is ideal. Managing the stress in your life effectively may help reduce your blood pressure. Mental and emotional stress can raise blood pressure. Meditation and deep breathing can lower it. It has been proven that meditation significantly reduced blood pressure. Yoga is a great de-stressor. If you believe in alternative treatments, try acupuncture. It is recommended to follow healthy eating plan. What you eat affects your chances of getting high blood pressure. A healthy eating plan can both reduce the risk of developing high blood pressure and lower a blood pressure that is already too high. Set up a healthy eating plan with foods low in saturated fat, total fat, and cholesterol, and high in fruits, vegetables, and low-fat dairy foods. If you are trying to lose weight, choose an eating plan that is lower in calories. Remember – YOU CAN DO IT !! !